"Everything Is Broken" is now in the Rattle audio archive. You can hear me read it here. out of more than 8000 entries. It appears in the Summer 2014 issue of Rattle as well as in the audio archive. My translation of "The Jewish Fishermen of Salonika" by Baruch Uziel has, at long last, been printed. 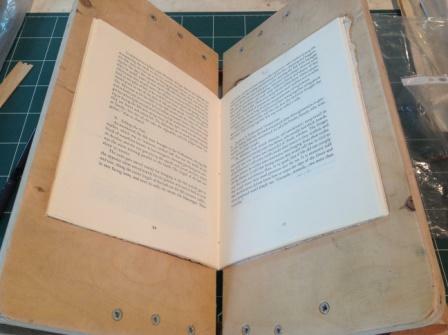 Here you can see it resting in the book cradle before binding. This project was generously supported by The Memorial Foundation for Jewish Culture in New York and includes illustrations by Lior Clop (Schiller). Follow this link to hear me read poems on You Tube, with other members of the Israel Association of Writers in English. Freshly minted type, finally ransomed from customs. Purchased from the lovely people at M&H Type in San Francisco. I found this proof press hidden in the corner of a shop in Jaffa flea market. I was fortunate enough to be in the company of two Goju Ryu blackbelts (Dan 7 and Dan 5), who kindly transported it to the car. We have devised an adjustable chase and magnetic gripper system for this press. I used it to print the artwork for my chapbook, Bad News. My old poem "Even Our Trees Fight" appears in the most recent issue of Phatitude, "Bridging the Cultural Divide:Remembering September 11th." 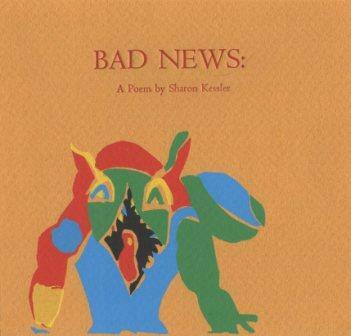 Bad News: A Poem by Sharon Kessler (and a new book, by that name). Accordian binding. Illustrations by Noga Farchi printed from photopolymer plates, with silkscreened cover art by Nahum Farchi. My new project, The Jewish Fishermen of Salonika, has been launched. The original Hebrew essay, published in 1961 by Baruch Uziel, describes the lives and work of Jews who worked for generations in the maritime trades until the destruction of the Jewish community of Salonika (Thessalonika) during the Second World War. The writer, a lawyer and Knesset member, was my husband's maternal grandfather, and we found his essay on this little-known chapter of Jewish history among my mother-in-law's papers after her death. Virtually no information on this subject is available in English, and the information in Hebrew appears in obscure sources. 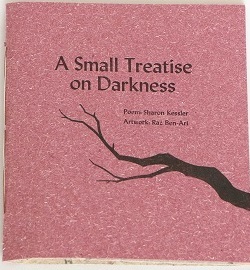 The essay, in my translation, will be published (if I can ever get my type out of customs, where it is being held prisoner) as a hand-set chapbook in an edition of 100 and will also appear in a special section of my Web site devoted to this project. This project was made possible by the generous support of the Memorial Foundation for Jewish Culture. My poem Stray Clothes appeared in Earth's Daughters. 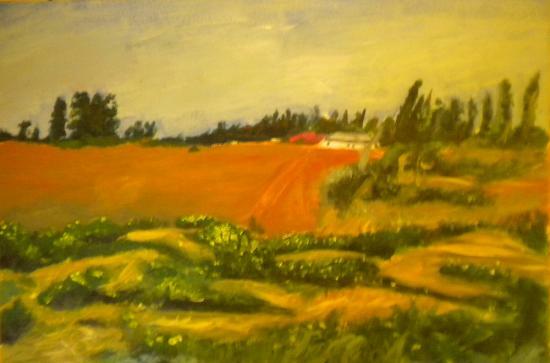 My son, Nahum Farchi, whose artwork you see on this site, won the judge's prize for local artists in a contest run by our local newspaper, Hagefen, for his painting, Field #1. 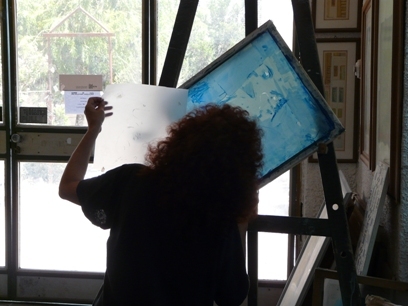 The winning paintings are on exhibit through the end of January in the Gallerina art gallery/cafe in the village of Bat Shlomo. Nahum also has a permanent online gallery of his work. 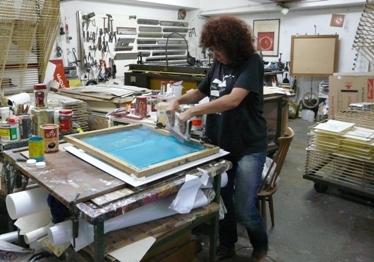 Over the summer I studied silkscreening with the inimitable Shoshana Shpinner, proprietor of Oscar Haifa Art Printers. 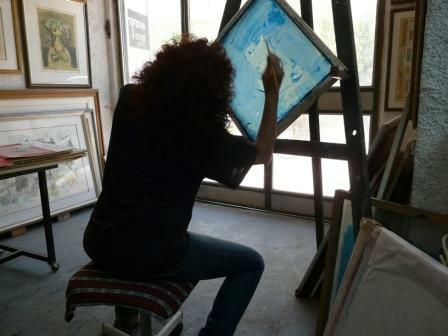 Here you can see me working on Blue Heron. 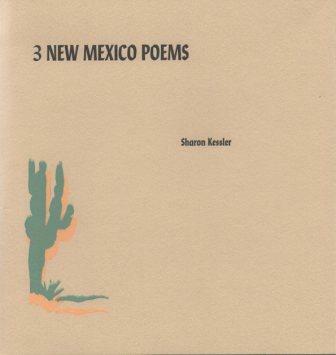 My new chapbook, 3 New Mexico Poems, has been printed in an edition of 50. 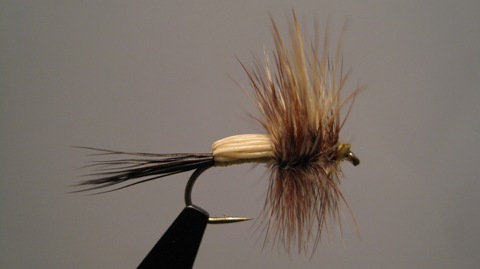 My brother Steve, proprietor of our NYC premises, ties his own fishing flies. This one is called a humpy. My dear friend, the writer Patricia Klindienst, author of the beautiful book The Earth Knows My Name, accompanies me to the Poet's House at their new location in lower Manhattan, where we donated 2 copies of "Trees" to the library. 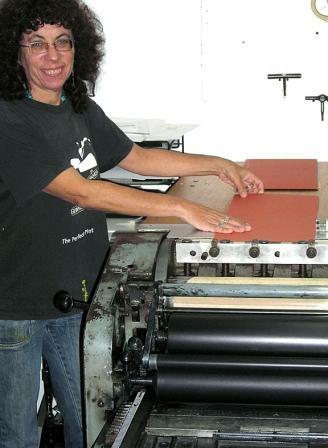 Under the guidance of Mindy Belloff, wonderful artist and teacher, I printed the covers for my next book, 3 New Mexico Poems, on a Vandercook UniIII at Studio on the Square in New York City. My friend Debbie Gersh, a fantastically talented interior designer and artist, has used our paper in some of her collages. See them, and more of Debbie's work, in her online gallery.